Running a business with your spouse is like an amped up version of being married. You are together all the time. You are having business meetings together, eating 3 meals a day together, watching the kids together, planning new content together. You do all of it together. And when you are used to being on your own it is weird to, all of the sudden, be doing it together. We are getting ready to celebrate 2 years since Brian quit his 9 to 5 job and have learned a few things. But my favorite part is that I get to run my passion project with my best friend. I don’t have to “fill him in” on things because he is here doing it with me. Maybe you + your husband work together. Maybe you guys are thinking about it. Or maybe you’re just curious about we do it! Whatever the reason, I hope that you find some encouragement in this episode. The importance of support when running a business together. How it’s not about who is the breadwinner, but about discovering who you are and the value you bring to the business. Boundaries when it comes to running a business with your husband. The pros + cons of working with your husband. Hey friends! Welcome to Episode 22 of The Purpose Show. In today’s episode I am going to be talking to you about working with my husband, Brian. Most of you probably know that we run our business together. We have an S Corp and my blog, my courses, and what we do in my business are all underneath our incorporation. We run that together and there is a lot that goes into that. Because we have a different dynamic in our relationship and lifestyle of running our business, I get a lot of questions, email, and messages about how this works. What is it like working with your husband? Do you like working with your husband? Does it cause any strain in your relationship? How do you balance the different areas of your life that you run together? Do you have boundaries? I am just going to talk about this for a bit and answer a couple of the more common questions. I would encourage you guys to find me on Instagram and send me questions if I don’t cover them in this episode. Brian and I really love talking about it. We are passionate about it. We love what we do and we love our lifestyle together, although it was definitely a difficult transition. We have learned a lot along the way. At the time this episode airs, we will be a couple of weeks away from celebrating two years since Brian quit his 9 to 5 job, which was more like a 7 AM to midnight job. It was a lot of hours. He worked six days a week most of the time, 12-14 hour days all the time. If you want to hear more about our story in terms of starting the business and how my blog got him away from that job, I would encourage you to listen to episode 6. It’s all about our story from complete poverty all the way to the other side through my blog and this business. Go check that out. I will link it in the show notes. It has been almost 2 years since Brian quit. I wrote in my notes to discuss the transition from “you’re always gone” to “you’re in my space all the time.” That’s really what it was. That transition was really extreme. It was literally like “you’re always gone.” Brian would come home late at night, way after the kids’ bedtime, and a lot of the time after I was asleep. He would eat dinner really, really late. Then he would get up early in the morning, before the kids even woke up. It was really, really hard. It felt like he was always gone. I did everything from dawn to dusk, bedtime and beyond, by myself. It felt like single parenthood. Making decisions. Running errands. Dealing with difficult toddlerhood issues. Raising the kids without Brian. We went from that to the opposite. He quit. He was home. We were together all the time. For the first few months the focus was getting my business up and running in a way that would fully replace his income, and then exceed it. And it did exceed it, more than we ever could have imagined. In the beginning he had to quit because it was necessary. It was, “either you quit or I do because I can’t keep doing it all.” I had the kids here, running our home life, cooking, taking care of the house, homeschooling, and trying to get a business to become a thriving thing all by myself. We prayed and decided that he would quit and we would take a leap of faith. We had seen that it was a viable idea but we just hadn’t gotten to that point yet. The first few months were fine because it was all about getting the business up and running and we did that together. Once it happened, we found ourselves in a different position. The business was doing pretty good. It was a lot but we were doing it together. It was great, but it was definitely strange for both of us in different ways. For Brian it was like, “who am I if I don’t get up and go to work every day?” I had rhythms and routines in place, that I didn’t even realize that I had. A way of doing my day with the kids. A way of doing “house” that I didn’t realize was so important to me. I quickly realized that it was so important when Brian came into the mix and was “around” all the time. “Messing up” my house, my system and my day. When you are on your own, doing life, all of the time, it is weird to all of the sudden be together all of the time. We had lots of different things that happened. We both worked on the business together – a lot – but Brian wasn’t leaving the house, going to a 9 to 5 job, clocking in, earning hourly wages, and then coming home. It was this never-ending thing where we were always working on the business, always talking about it. We were taking turns sharing the load of the house, the kids, meal preparation, and all of those things. He started to plummet into this depressiveness from being “shell shocked.” He was grateful, but also kind of ungrateful because he felt like he didn’t know who he was without going to work every day. And I was struggling with just being “annoyed” all of the time because he was just kind of “there” all of the time. It was just hard for us. It was also weird. We were both so grateful and this was what we wanted. To be honest, we felt weird to be having a hard time with it. We didn’t have any role models of people who had done this before us. My parents are entrepreneurs and they owned two businesses together since I was born, but it was just different. My mom ran more of a secretarial role in the business and my dad ran the physical “going and getting the job done” part of the business. It wasn’t like ours. Our business is online, at home. We were making decisions and running it together. There were really good things about it. We had awesome brainstorming sessions. We fell into this routine of doing that together every couple of days. We would get the kids in bed or lay them down for naps and then go into the office and shut the door. We had a wall full of white boards. We would have lunch together and come up with all these new content ideas. It was so fun. It was so nice to have him there for that because I was trying to do that myself. 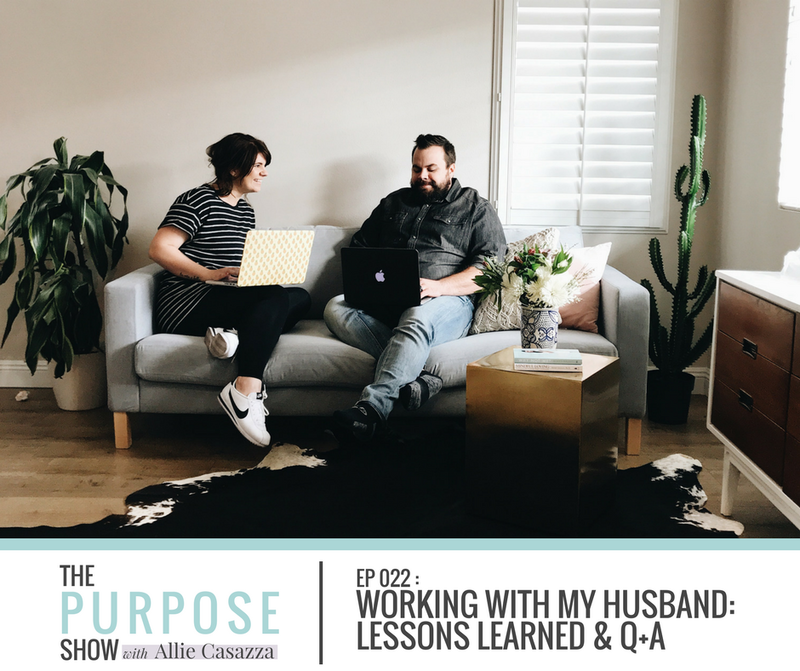 I am a very external processor, so it helped me greatly to fall into that routine of doing those audible, verbal brainstorming sessions with my husband, who is also my best friend. I trusted him. We had that really great dynamic together. It was really good. It wasn’t like he left work and it was just awful. There are some really difficult parts of it that I want to be honest about. I feel like in today’s day and age, it is easy to make everything look super fluffy. While I am always really real, I can only share so much on social media. This is more of a platform where I can dive a bit deeper, and be honest. I want to share some of the things that we struggled with for some of you who may be in the same place, or may be considering getting into this lifestyle. I see it like this: Marriage already brings out your flaws. Everybody knows that. Anyone who has been married will tell you that. In wedding ceremonies, the pastor always makes a joke about that, or comments on that. Marriage will really bring out any flaws. Anything you think is quirky or comical about a person, will soon become an annoyance and a major flaw once you are married and settled in. That’s just what marriage does. It brings out the flaws of the other person to you. And it brings out your own flaws to them and to yourself. But being married and running a business with your spouse, will not only bring out your flaws, but it will shine a five billion lumen floodlight on them. And bring out a thousand others that you may not have known you had. Or that the other person had. It is very vulnerable. It is very unique. It definitely will show you everything that is wrong with you. It will show you everything you don’t like about the other person. It will show you every difference that you have. I found the key to navigating it is to decide that you are going to work through things. That you are going to work through the differences and problems instead of ignoring it, sweeping it under the rug. Ignoring it because you are too busy and you need to focus on the business. Or just calling it out and saying that you don’t like and demanding the person to change it. Running a business with your spouse is like being married on crack. It is a really amped-up version of being married. 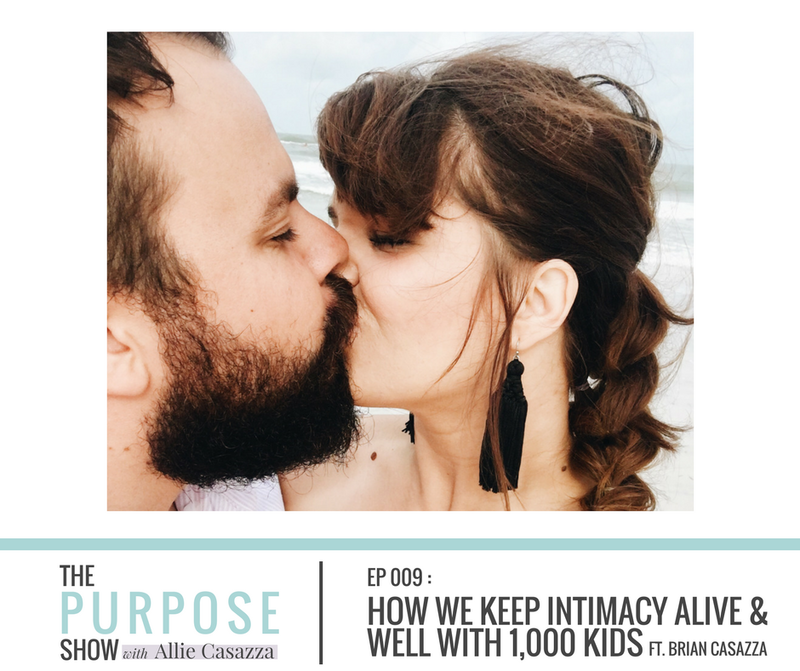 Having said that, I wanted to dive into the things that I have learned in the past two years of Brian being home with me and us running the business together. These are a few simple things that came to my mind when I was thinking about this episode. The first thing I learned is that his support is so crucial. In our relationship, I am definitely more of the self-centered one. I am more of a “taker” and Brian is more of a “giver.” I am more of the classic entrepreneur. The “don’t stop until you make it” type. I come up with a lot of ideas. I just have an entrepreneurial spirit. It’s not like I walked around saying that to myself all of the time. It was just an inner attitude. I very quickly learned that Brian’s support is so crucial to my success and the success of my business. I definitely could not have him be indifferent or not thrilled about what I am doing. I will fully admit that I need him. I need him in my life. I need him in the house. I need him in my business. I need his support. I need his brainstorming sessions. I need his input. I need his calm, steady presence when I have to fire someone, or have a difficult discussion with someone. I absolutely would do this so much worse without him. He is crucial. His support of the business, my passion, my mission, and what I am doing, is so, so crucial. The second thing I have learned is that being the breadwinner is inconsequential. It doesn’t really matter. We learned together that Brian’s value does not lie in being the breadwinner, which he was. We had always been in agreement that I would be home with the kids. I never really imagined doing anything else. It’s not like I was a stay-at-home mom who was always bored. One who couldn’t wait for her kids to get older so she could do her own thing. I had a lot of friends who had that mindset, but I never related to that. I was very, very content to be a stay-at-home mom. When things got really difficult and super tight, I would always think about getting a part-time job or find a way to help. Brain would always say, “If that’s what you really want to do, I will support you, but I do not want you to do that for money. I love having you here and I know you love being here.” That’s the page we both landed on for forever. It’s so funny. I can’t even tell you how surprised I am that this is where we have landed. That, not only do I have something else that I am doing, but that it is our livelihood. Without Brian, this business would fall apart because I would not have that support, encouragement, and brainstorm sessions that I desperately need to keep this thing going. And to keep myself going so that I can do these things. I am such an introvert. I love what I do. I love it. But at the end of a day of recording, interviews, speaking to a group of women, I am just so drained. And he knows exactly how to refill that well for me. How to help me refresh my spirit and find rest. He knows when I need to talk and when I need him to not talk at all. He is so supportive and encouraging. I just couldn’t do this without him. It’s not about either of us being the breadwinner. It’s become an identity in our culture. We quickly saw that. We quickly saw how much Brian was depending on that for himself as a man. Finding his identity in what he did. He didn’t find purpose in what he did (installing cable), but he found purpose in supporting his family, being the breadwinner and providing. Outside of that, he didn’t really know who he was. Who can blame him? With those hours it’s not like he had time to go on a soul-searching expedition or anything. We see it as, “Could I find someone else to take photos and create videos for me?” Of course I could. 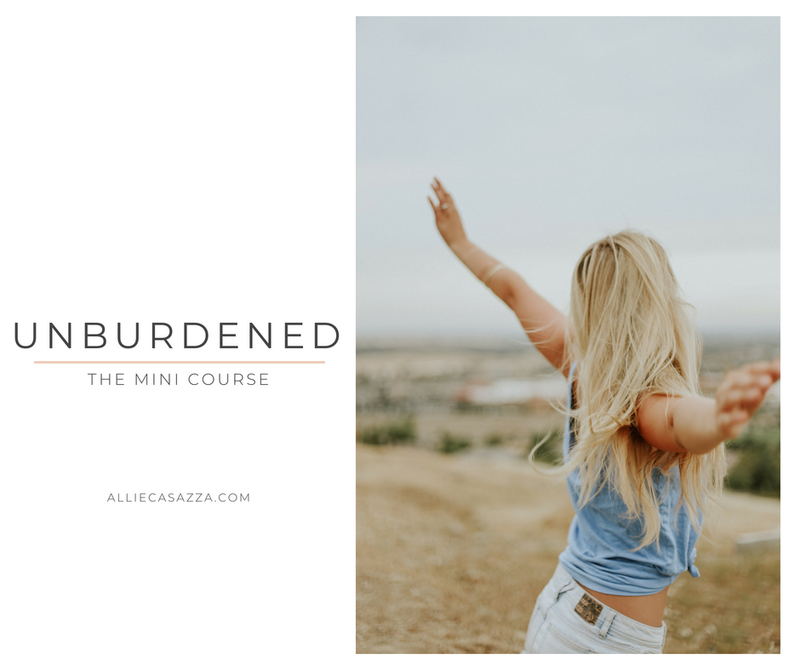 Without me the business would keep going, just without any new content straight from Allie Casazza. Neither of us is “all important.” Neither of us is the “breadwinner.” We are both replaceable. However, we are both a reason this thing has taken off. We are both looking up, praying, as we seek God’s guidance in managing His business. It’s His; not ours. We are both working hard to spread this message of hope and light further and further for mothers everywhere. We are both passionate about that. Brian’s passion comes from mine. We are connected. We are one. I am so passionate about this that it has made him passionate too. This is our business and our thing. We purposely built the business up to a point where the team is managing the backend so much that if something traumatic happens in our family and we need to fall off the face of the planet for a year, the business will keep going. Keep making money without us. It is good. It is something that give us peace. We are both totally replaceable. Neither is more important than the other. Just because it’s alliecasazza.com, and it’s my voice in your earphone right now, has nothing to do with it. Because I wouldn’t be here, talking, if it hadn’t been for Brian. Truly. I wish there were more words in the English language for me to express how valuable and precious his support is to me. The next thing that I learned is that boundaries are good. When you are married, you have kids, and a business – boundaries are good. But sometimes we don’t feel like we need them. I guess what I mean by that is when do you talk about business? When do you talk about homeschooling? When do you talk about you? When do you discuss your life on date night? I have heard the rule, “don’t talk about the kids or business on date night.” I understand why people say that. I don’t know if maybe Brian and I have something different than other couples. Everyone seems to give that advice. Business can get touchy; it’s related to money. That can be a hot button issue for sure. But, Brian and I are really passionate about what we do, what our business is for and we like talking about it. When we go on date night, we always talk about our kids. About homeschooling. About what we want to do about business. Talk about work. Talk about our team members. Talk about what goals we are reaching. We also talk about other things, like what books we are currently reading. What we feel like we are learning in our relationship with the Lord. We also talk about us. I guess I would say that boundaries are good and they have a place, but it’s OK to feel like you don’t really need them. You just love what you do. You love your life together. Your business is a part of that life. Your kids are a part of that life. Your work is a part of that life. We definitely make sure that there is a balance in our talks together. I will say, “how do you feel about us and where our relationship is at right now?” Then we can steer the conversation away from the kids and business, and just talk about us. We talk really openly with each other. We are so open with each other. We will talk about our relationship. What problems we think we have had lately. 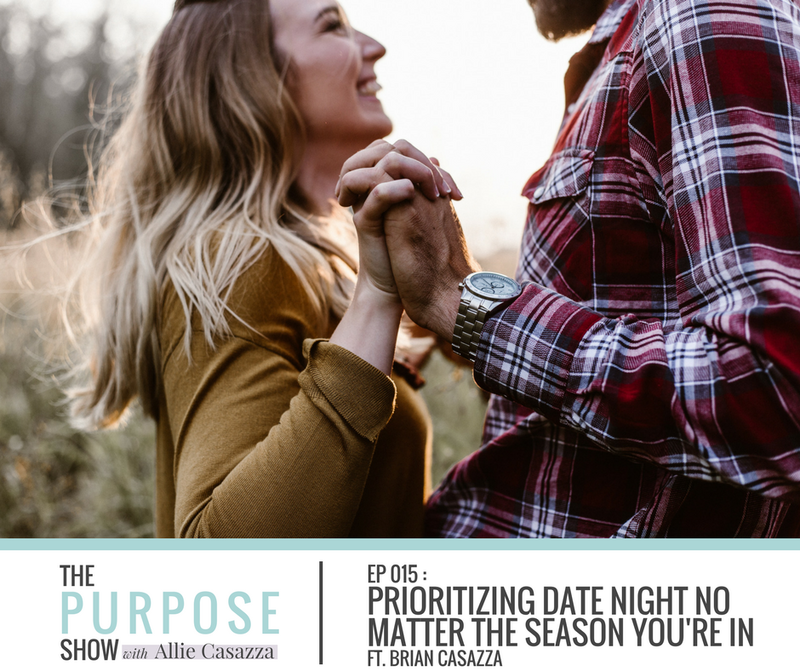 Brian might flat out say, “I feel like we need to spend a little more time alone together and not with the kids.” “I really feel like we need to up our date nights.” A few months ago we really amped up our date nights. We go every week, religiously. And we love it. We have that balance. What needs our attention right now? This is our life together. The kids. Money. It’s all a part of it. If it is date night and there is something that needs our attention, but we are pretty good, we will talk about it. We don’t have those hard boundaries. It would make me so stressed to not talk about something that we need to talk about. I am an external processor. Brian is such a good listener and he loves talking about our life together. He always wants to ask me questions and find out what I need help with. Is there anything I want to talk about? Is there anything new going on? More often than I, he will have things to talk about. We like talking about our life together when we are together. I have found having those tight boundaries doesn’t work for us. We definitely do have some boundaries and times where we need to focus more on us, but we kind of go with what we need. What we need to talk about. What needs our attention and we both enjoy doing that together. I wanted to talk about that famous saying, “absence makes the heart grow fonder.” There is truth in that. We definitely felt that from our previous lifestyle of always being separated and really missing each other. When we were planning this big change in our life, I was definitely worried how that would affect us. Absence makes the heart grow fonder because reality fades away. When you are together all day, every day, you are in it together. You are doing life and all the mundane parts of it, side-by-side, hand-in-hand, together. And in that, presence makes the heart grow fonder. I do not feel like sobbing through another episode (referencing episode 6 again) but I do want to communicate that I just don’t know where we would be if we didn’t make this transition. Things were so hard and our relationship was always strong, close, and open. I was always so proud of our relationship despite our hardships. But being together – all day, every day, sharing the load, doing life together, really truly, in day-to-day situations that you can’t have if you are not together – has grown us closer than I ever thought possible. I don’t want anyone to be really annoyed, turn this off, find me, and slap the crap out of me in an alleyway somewhere because they were so annoyed by what I am about to say, but I have just have to say it. Sometimes I just stop and think about us and I just can’t believe this. I can’t believe how close and sweet our marriage has grown from making this change and actually doing our days together. It has really made a difference. I want to encourage you guys that if this is something you want and you’re worried about it. Yeah, it’s going to make you work on stuff. But it is going to make you work on things that you would get out of working on if you weren’t together all day, every day. To wrap things up, I wanted to touch on what I like about this lifestyle and what I don’t like about it. Keep it super honest. What I like about this lifestyle is the freedom. Instead of having “work hours”, I have more of a “running task list” that I can fit in whenever it works for me. If we want to ditch everything for the day and go to Disneyland with the kids, we can – because of homeschooling, running our own business and being the CEO’s. It’s really nice. It works really well for being such a busy family. It definitely helps me remain pretty mellow because things can ebb and flow and switch around when they need to. It makes it unpressured and easy. Another thing that I life about this lifestyle is the constant help from each other. If Brian needs help, needs a break, or really wants to make it to a Crossfit class, I can take over and just do everything. Actually, by the time this comes out he will have returned, but in a couple of weeks Brian is going on a guys’ trip to Nevada for a full week. That’s something that he really, really needs. It is going to be so good for him. I am so happy that he gets that time. I will be taking over. I have cleared my work schedule. I will handle all the homeschooling and the house. Go back to how things used to be for a week. I have his back. And I can make sure he has a great time. I am holding down the fort. I can’t even tell you how many times it has been reversed. I am in a Mastermind and we did a retreat in L.A. I was gone for 3 ½ days and Brian took over and handled everything. I don’t come home to a disastrous house. I don’t come home to everything undone and the kids haven’t showered. We have each other’s back. When I needed to visit my friend in Florida, he was here. When we lived out of state, and I wanted to come home to California and visit family to do some test runs for the creation of my course, he held down the fort for five days. We take turns. We have each other’s back. That’s neat that we have the freedom to do that. I also think that doing day-to-day life together is pretty uncommon because of jobs. It’s really beautiful. It gives us something that others don’t have. I see that a lot. I am really grateful for it. My favorite thing is being able to run my passion project with my best friend and not having to “fill him in” on things because he is here doing it with me. I have a couple of things that I don’t like but I don’t want to focus too much on them. Honestly, we have worked through them during this process (like I was talking about before). But, of course, there are pros and cons to everything. What I don’t like is those “blurred lines.” Are you the co-owner of the business? Are you my co-teacher with kids? Are you my husband? It definitely blurs the lines and that can be difficult sometimes. Of course, there is a heightened chance of arguments. It was really bad at first for sure. We really struggled. We went through about six months of constant bickering because we were just not used to being together all day. We were balancing a lot of new things. It was a stressful time. It was very new. It was super, super hard. There is more that we are doing together, which makes more to argue about. But I can tell you from the other side now that you can work through that. You can totally fix that. It is not like that at all anymore. It is in the past. We are so far removed from that. But you need to be on guard. You need to remain kind and respectful of each other. You have more against you in terms of arguments. I think it is important to always choose gratitude. At some point in your life, all your hopes and dreams, can happen. They can turn sour if you choose to focus on the negative or you don’t work on the hard parts. The grass is always greener on the other side. When you get there, you are going to have problems, just different ones. You have to choose to stay grateful, focus on the positive, and work on the negative. Don’t just accept it as what it is. Don’t be annoyed about it. Don’t let it make you resentful. Choose gratitude. Work on things. And your life can totally turn around from that.